Why didn’t they use ‘Stayin’ Alive’? The Martian, directed by Sir Ridley Scott, is the film adaptation of the best-selling book from Andy Weir. Mark Watney is part of a 6 man crew of the Ares III, a manned Mars mission. When a freak storm occurs, they are forced to abort the mission and go back to their ship, the Hermes. However, when Mark is hit by flying debris, he is presumed dead and left behind. He is of course, not dead and finds himself stranded on the Red Planet. And so, with limited supplies, he must find a way to communicate with NASA, grow more food, and in general a way to escape from Mars. As I’ve said, the movie is based on the novel of the same name from Andy Weir. The book is not your usual standard sci-fi fare. Aliens are nowhere in sight. This is hard, down-to-earth science. Usually something like ‘if I x reacts with y it’ll make z, but I don’t want z, so I’ll heat x and let that react with y, which in turn will make a. But to heat x, I’ll need to bla bla bla…’ gets looked over in sci-fi, or at least not went into detail. The novel, however, relishes in that science explanation. We want to know how to heat x. That type of story-telling of course can be considered boring to some people, and while I can see why, I personally am a sucker for these things. I deliberately bought the book and read it within a month to prep myself for the movie. And as I was reading it, I was kinda skeptical about how the film would turn out. Sciency-talk movies don’t really have a wide appeal, and to make that interesting for 2 and a half hours? Props to the screenwriter Drew Goddard and Ridley Scott for making 2 and a half hours worth of science engaging as all hell. It’s a shame that I couldn’t watch this in IMAX, because oh my god Mars is so beautiful to look at. Sweeping shots of the desolate planet and just the overall…red of it makes it so eye-warming. And when it’s not flying around Mars, the camera is hand-held, getting down and dirty with Mark Watney and the people at NASA trying to help him. Ridley Scott really has a great eye for visuals. But then,what did you expect from the guy who made Alien? The cast is impeccable. 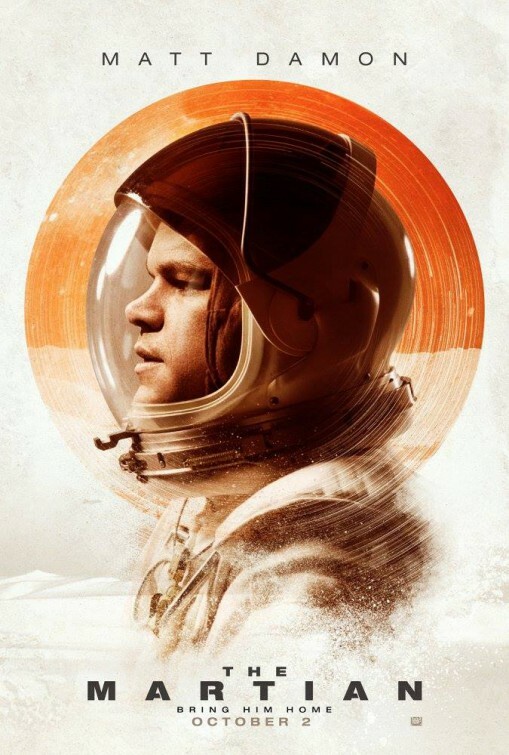 Matt Damon is a great Mark Watney, being able to be humorous and sarcastic, but still know when to shut up and think. The people in NASA who try to bring Watney, from Jeff Daniels to Donald ‘Childish Gambino’ Glover are all great, the crew of the Ares III, played by Jessica Chastain, Michael Peña, Kate Mara, Sebastian Stan and Aksel Hennie, while having less screen time than Watney or the NASA people, still do a good job. I have no problems with the cast at all. If I have anything bad to say about The Martian, it’s that I wished there was more sciency-talk. What I got was a more than substantial amount, and I’m very happy with I have, but I just want more. Even if it extends the movie to Satantango length, I would still watch it. Besides that, I have no negativity about The Martian to say. Overall, The Martian is a masterpiece in science fiction, even-though the fiction isn’t as far-fetched as other movies. Definite recommendation, and a must watch on IMAX. Also, according to my fellow friends, one of Ridley Scott’s best in quite a while. This entry was posted in Film, Movie and tagged 2015, Aksel Hennie, Donald Glover, Drew Goddard, Jeff Daniels, Jessica Chastain, Kate Mara, Matt Damon, Michael Peña, Review, Ridley Scott, Sean Bean, Sebastian Stan, The Martian.